U.C. Berkley Professor and President Obama’s former Chair of his Council of Economic Advisers (CEA), Christina Romer, published a paper in 2010, concluding that a tax increase of 1 percent of GDP, about $160 billion today, reduces output over the next three years by nearly 3 percent, or $480 billion at current GDP figures. And according to the Bureau of Economic Analysis, per capita personal income is currently running at around $37,500. Thus, Barack Obama’s plan to raise taxes on the most productive American citizens would result in a loss of around 12.7 million jobs over the ensuing three-year period. But fortunately, U.S. policy makers aren’t naïve enough to place their trust in the hands of a novice. I wonder what India’s economists think. In 1997, the Republican-led Congress passed a tax-relief and deficit-reduction bill that was resisted but ultimately signed by President Clinton. One of the things the 1997 bill did was lower the top capital gains tax rate from 28 percent to 20 percent. It was actually the 1997 tax cuts, not the 1993 Clinton tax hike, which produced the boom of the 1990’s. The reduction of capital gains rates encouraged greater investment, which lead to GDP growth, and an increase in both economic activity and tax collections. The same policy will work today. However, what Barack Obama is proposing is exactly the opposite. Obama’s notion of raising income taxes on some taxpayers, health care taxes on others, and capital gains rates on investors, to name a few, amounts to an artificial tax hike, which most economists agree will result in a reduction of GDP. Thus, Obama’s tax hikes are not in the best interests of the country. But he doesn’t appear to care about our common welfare. Obama’s policies are admittedly not about economic growth, but rather about furthering his self contrived, yet erroneous, notion of fairness. Yet the truth is that the very concept of taxing capital gains is in itself unfair. The method in which capital gains are calculated in the United States is antiquated, illogical, and actually hinders our ability to reach a full recovery. In order to understand the dilemma, one must put himself in an investors place. An Example: Let’s say an investor makes a five year commitment to invest $100,000 into a public or private company stock. And let’s say the rate of inflation is averaging 3.0% per year. By the time the investment is sold, what cost $100,000 five years ago, may cost as much as $115,000, due to inflation. So if no gain is realized on the investment, the investor automatically loses $15,000 in purchasing power. Now let’s assume that five years later the investment has grown from $100,000 to $115,000. Under the current U.S. tax code, upon redemption of the stock, the investor is subject to a 15.0% tax on the gain. A capital gain of $15,000 is calculated by subtracting the amount of the original investment from the sales price ($115,000 – $100,000), and the amount of tax due is $2,250 ($15,000 * 0.15). So to summarize, an investor made a 5-year investment of $100,000, recognized a long-term capital gain of $15,000, paid a capital gains tax of $2,250, and got to keep $12,750, or 85.0% of the gain. Most people think this is fair enough, but there are a few scoffers out there who think a 15% capital gains tax is too low. So let’s examine the question of fairness. Most of us are aware that the dollar has lost roughly 96% of its value since 1913 (see chart at the top). With that in mind, if instead of investing the $100,000, as in the example, the investor chose to hide it under a mattress, what would happen? For one thing, no taxes would be due. But at the same time, when the money is spent, 5 years later, its purchasing power will have declined by $15,000, again due to inflation. In fact, the reason most people choose to invest their money is to simply maintain the purchasing power of their savings. In the example, the investment barely appreciated enough to keep pace with inflation. Therefore, no gain was realized. Inflation ate up $15,000 of the investor’s purchasing power, which was merely recovered through appreciation in the stock. But now along comes the U.S. government to lend a helping hand. And because of its antiquated and illogical tax policies, the federal government levies a 15% tax on what, for all practical purposes, isn’t a gain at all. The government then collects what it deems to be its fair share of a gain, but the investor hasn’t actually gained a dime. In fact, once the tax is paid, the investor realizes a loss in purchasing power. Does that sound fair? Who knew that maintaining the value of the currency in ones possession was a taxable event? In India, capital gains are computed differently than in the U.S. Under India’s tax law an investor is allowed to increase the cost of the original investment by the annual inflation index, before computing a gain or loss. Had this been done in the example above, the basis of the original investment would have been stepped up to $115,000 before computing a net capital gain of $0 ($115,000 – $115,000). In India, it is considered unfair to tax someone for merely recouping the inflation adjusted value of an investment. It’s unfair because the sales proceeds of an investment are derived from the current value of the currency, whereas its cost was based on a value that existed in the past (five years prior in the example above). The following countries are even more progressive, they don’t tax capital gains at all: Belize, Barbados, Bulgaria, Cayman Islands, Ecuador, Egypt, Hong Kong, Islamic Republic of Iran, Isle of Man, Jamaica, Kenya, Malaysia, Netherlands, Singapore, Sri Lanka, Switzerland, and Turkey. Other countries, like Canada and South Africa do levy a capital gains tax, but only on 50% of the gain. A few nations even allow their citizens to defer capital gains taxes entirely by allowing them to rollover their gains into a new investment within certain time frames. One has to wonder why anyone in their right mind would be encouraged to invest in the United States. Considering that inflation doesn’t stop when an investment is sold, while the money is sitting around waiting for the tax to be paid, it continues to lose value. And once the tax is paid, the remainder continues to diminish in value until it is ultimately reinvested. In light of the colossal decline in the value of the U.S. dollar over the past 100 years, the question we should be asking ourselves is not what rate to levy on capital gains, but rather why the tax even exists? No wonder many Americans choose to invest abroad, and in some cases to renounce their citizenship entirely. These days, if you want a fair shot, and if you want to pay your fair share, you might have to set your sights beyond the shores of the United States. The bottom line is that the U.S. Tax Code needs an overhaul. Our tax policies should be upgraded to something more along the lines of reason and common sense. Like India, we should at the very least index the basis of long-term capital investments to inflation, for purposes of determining taxable gains (and deductible losses). This concept should be applied to all forms of capital investment. If the federal government refuses to implement policies which encourage GDP growth, then how does it expect the economy to grow? When our wealth is being slowly eroded by inflation, and then we’re taxed on the deteriorating value of our currency, it pretty much makes investing in the U.S. futile. If the federal government wants to encourage investment in the U.S., which is what it should do, in order to stimulate GDP growth and create jobs, then our elected officials should stop talking about raising tax rates on both ordinary income and capital gains, and start discussing ways to lower the tax burden and make our system fairer and comparable to more just investment havens. Here’s some more food for thought. Why is interest income taxed? 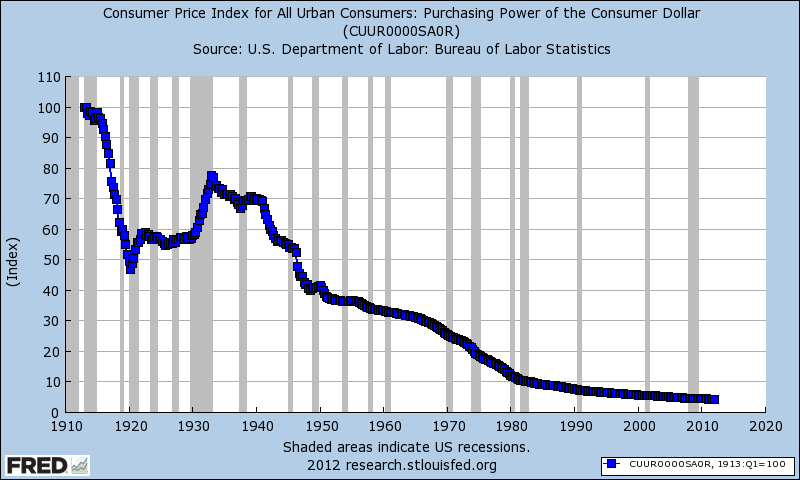 When a saver is earning less than 1.0% at a domestic bank, while inflation is running at more twice that rate, why is the federal government entitled to any part of what amounts to a decline in purchasing power? What you earn on a bank account these days isn’t interest income; it’s more like a taxable capital loss. What about dividends? Dividends are already taxed once at the corporate level, are not deductible by corporations for tax purposes, and then are taxed again after distribution to the investor (double taxation)? Taxing interest and dividends isn’t fair either, and the practice should therefore be repealed. No American should ever have to pay a tax on capital, especially when upon its return the inflation adjusted value is the same or less than the original amount. Is the U.S. taxing the eroding value of the dollar because it makes sense, or perhaps because when the tax code was conceived no one anticipated that the dollar would lose 96% of its value over the ensuing 100 years? If you think our current method of taxing interest, dividends and capital gains is fair, then please explain your reasoning. If you think that taxing the deteriorating value of the dollar is a way to foster economic growth, then why has real GDP growth only averaged approximately 1.5% in the United States over the last 12 years? nice information. you can got more information here: http://www.inthelatest.com/long-term-capital-gains-tax/ i got it from internet. Its' even worse in the UK, inflation is a stealth tax here.